What is the salary of a specialist in Digital Marketing? A large number of deals do not indicate wages, so the compensation will depend a lot of the candidate's profile. Published salaries are below market price ... but unfortunately for candidates are quite realistic wages. The highest paid are specialists Business Intelligence Y BigData a range from 28,000 € to 41,000 €. The lowest paid are the Community managers (This has not been a surprise). Its range is between 14,000 € and 17,000 €. SEO every day is less glamorous ... and that every day is more difficult. Web analytics specialists should include the word "Business Intelligence"In their curriculums ... (and be formed, obviously). But this is the most profitable conversion now, the best bet for climbing the salary scale digital marketing. 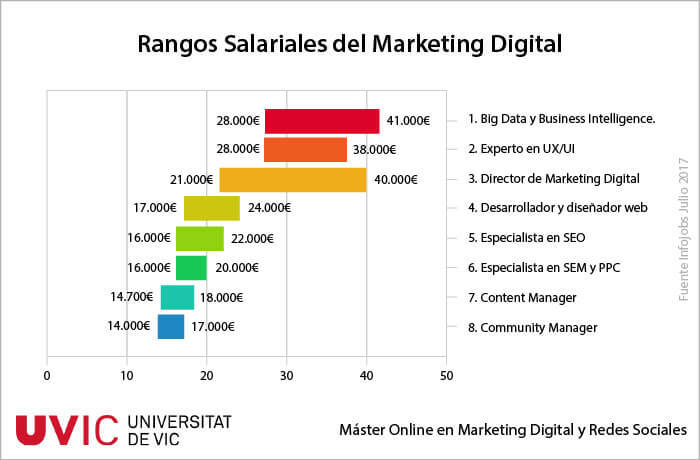 To read the entire report with all salary ranges and specifications for each job, you can see it here: The salary of a specialist digital marketingAlso during the following weeks I will write an article on each of the jobs. I hope this information will be useful whether you are a candidate, as if're looking for a specialist in any of the Digital Marketing related fields. 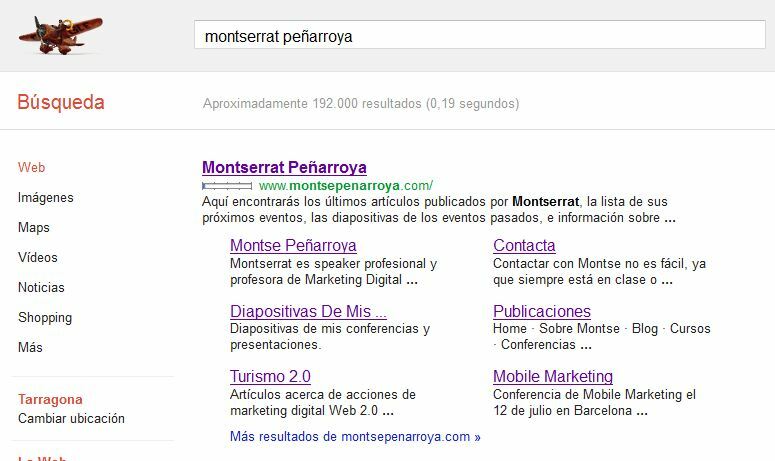 https://www.montsepenarroya.com/wp-content/uploads/2017/08/Rangos-Salariales-del-Marketing-Digital.jpg 460 700 Peñarroya Montserrat https://www.montsepenarroya.com/wp-content/uploads/2017/09/MP-Logo-Web-1.png Peñarroya Montserrat2017-08-15 11:26:242018-04-01 13:45:29What is the salary of a specialist in Digital Marketing? Today I started to teach my classes in the Master Search Engine IDEC-UPFSo I start to get interesting questions in the forum of students. I think some of them may also be of interest to people outside the master, so here's one: the question student at the user level, what is the difference between codes Google Adwords and Google Analytics, and where can find. Conversion codes Google Adwords You are provided this service and should be included on the final page of what you consider to be a conversion. For example, if you have an e-commerce, must be codes on page: "gracias.php" ie last page of the checkout process, in which you thank you for purchasing. Thus, when a user who has entered your site from an Adword, completes a purchase, Google Adwords knows why not perceived this, the user activates the code and Adwords account that can offer it as a sale, which makes statistics on how many customers have achieved through ads and how much it cost you to get each of them ... without this code can only tell you how many visitors you had and how much it cost you to get them. The conversion code you find Google Adwords Adwords menu under Tools -> Conversions. On the other hand, are codes google Analytics. Estos deben incluirse en todas las páginas del sitio web, de esta manera, Google puede ir haciendo el seguimiento de qué hacen los usuarios en ella. Los encontrarás en Administrador –> Propiedad –> Información de seguimiento –> Códigos de Seguimiento. 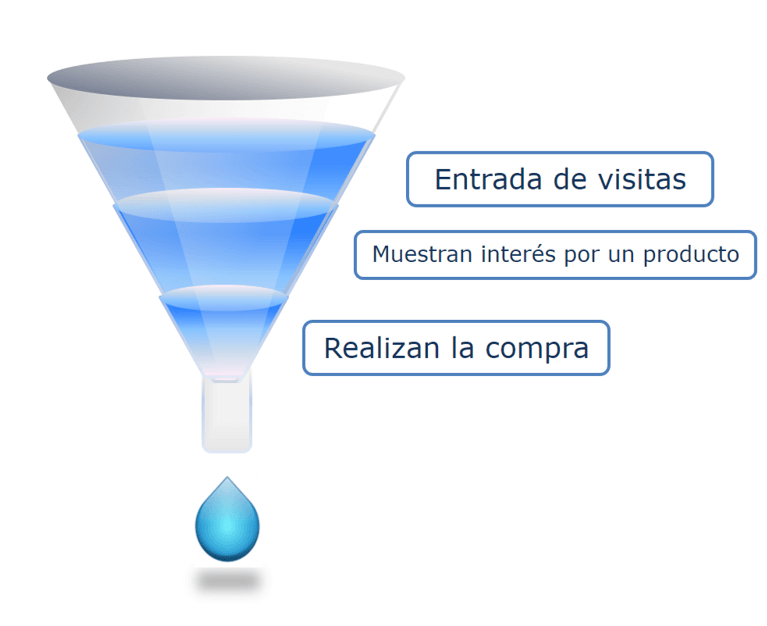 Para conocer las conversiones de tu web desde Google Analytics, no hay códigos especiales, debes ir a Administrador –> Ver –> Objetivos–>Crear objetivo y allí le indicas que el objetivo es llegar a la URL “gracias.php” y así Google Analytics sabe cuántos usuarios han llegado allí y por lo tanto, cuántos clientes has tenido. También sabe de dónde venían, por donde han navegado antes de iniciar la compra, y si tienen una sesión de Google abierta, puede saber si son hombres, mujeres, la edad y sus intereses… un montón de cosas, vaya. As you can see, the two systems are different but have similar goals, although one is oriented control of ROI in advertising campaigns and the other not. I hope the answer has been helpful. What variables affect the value of a website? Variables that affect the value of a site: the domain name, users of your website, market segments to which users belong, your database, your audience on social networks. How much is a domain name? The market price of a new domain is between 5 € and 15 € a rule. It all depends on the domain extension you use (.com, .es, .cat, etc.). This year we have put on sale a lot of new extensions and each extension manager decides the price of the domain extension. Search for a domain here CDmon.com the price for that domain with different extensions, if new. There are numerous markets where you can buy domains containing words of great value. If also the domain and the extension becomes a meaningful sentence, the value is even higher (in English call "domain hacks"). For example: www.aero.taxi is for sale at Sedo for $ 699. Typically your site already has a history, if your reputation is good, this is also payable. A domain with history and good reputation is worth at least 1,000 euros. How users a website worth? 1) Number of visits. For example 100,000 visits per month. 2) Page views per user. For example 4 pages per visit (see your Google Analytics). 3) Monthly Pageviews. Current will tell you the your Google Analytics, but if what you want is to make a prediction, then multiplied visits you think you have, the pages visited per user. 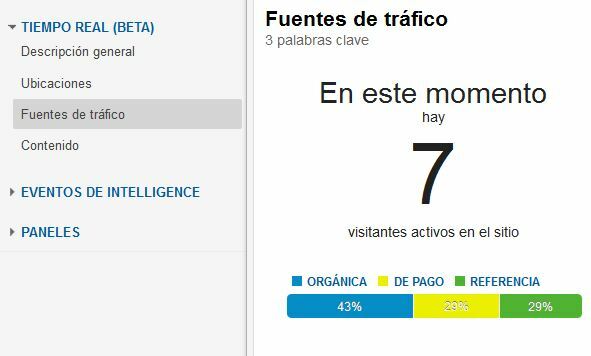 With affiliate programs you'll find the Zanox (www.zanox.es), with 100,000 visits you can check about 750 € (calculated with conversion rate of 3%, 4 page views per user, and collection of 1 € per contact achieved). If your users belong to a market segment that is appreciated by advertisers. For example, women aged 25 to 45 years interested in cosmetics. Then the price can increase dramatically advertising may reach 20 € per 1000 page views. How much is a database? Remember that the Data Protection Act prohibits you from selling data from your users, so this is the value if signing over the company and the data were valued as assets. You have to monetize with advertising or sponsored messages. How much does the audience on social networks? This is easy to calculate because you can know if you approach it from the point of view of how much it costs you to advertise on social networks and get more followers. Twitter and Facebook, a follower cost about 1 €. So if you have 1,000 followers, your network has a value of 1,000 €. Again, segmentation or a special public can make up this price. With all this data, you can calculate the value of your website or so. On the internet you will find a lot of websites that calculate the value of your website. checking that they normally have in Alexa position (and with that know about traffic you have) and on that basis calculate the advertising performance you could get. But they do not take into account other variables we have discussed here ... so I would not trust a lot of these tools. Make your calculations and see the result. Although entrepreneurial advice and eBusiness specialist teacher. A website is worth what you are willing to sell to you charge for. You have to start thinking: if I pay 1,000 € I sell it? No. If I pay € 10,000 I sell it? Maybe. If I pay 100,000 me sell it? Yes. Well wing, you have a price range. Refines and find the value you give to your website. A web worth what someone is willing to pay for it. The willingness to buy from people and businesses is not always rational. So although calculated as we have done in this article value is one, someone may be willing to pay more for it. Or less ... given the case. The final value of your website which will consider 3 things: the asset value, the value you give it, and the value that gives a prospective buyer. I hope this article has been helpful. 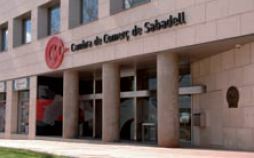 La 5ª edición del Digital Marketing Course organizado por la Cámara de Comercio de Sabadell está a punto de empezar… pero aún quedan una pocas plazas libres. Today we dedicate this article to how to improve the results of our SEO strategy to attract more visitors to our website, without even touching the site. One of the things we can do is to improve the persuasiveness of our results when we appear already in first place. To do this, the first thing we should do is improve the texts of the hierarchical results (or "sitelinks" as Google calls them). What are nested results or sitelinks? When Google finds more than one result on the same website, first displays the most relevant and the other relevant pages from the same website are staggered below it in the form of two columns. These links are generated automatically. How I can manage what appears in columns? Change what appears in the two columns can be done from Google Webmasters. This requires registering as a webmaster of the website www.google.com/webmasters and once on the control panel of this tool, management will find the menu in the "Site Bindings" section. From here we can tell Google what we do not want to appear using the "downgrade a URL". That is, if we see that between the site links is a URL we do not want to appear, we can indicate to Google Webmasters that lowers the position of that URL and make it disappear from the list of ranked results. It would be much easier than Google allow us to indicate what we want to appear in this area ... but it can not be done. To get the pages we want to show, we degrade that Google selects itself. What advantages does it have a good hierarchical results? Above all, we can show in the results, and in the first position of Google, the most relevant information on our website. Find a correlation between the pages in this area and the most visited of our website (you will see looking at Google Analytics). It is also an excellent way to convey a good first impression to our users. Of course, if we have good statistics on Google Analytics (with well set goals), it is clear that a good strategy would be to select for this area pages we report conversions on the website. It is possible that all the hustle involved Christmas and the days leading up to it, you have not noticed that in google Analytics now it offers data about visits to your website in real time. The truth is that since a few months ago google Analytics displays real-time data (the Google news was made on 29 September), but talking to students and clients I realize that many people are not aware of it, especially because Google only displays this data in the new version of the Web interface and people accustomed to the old it costs a little change. To monitor in real time an advertising campaign (Adwords or not). To see immediately the effect of a message posted on Twitter or Facebook on our website. The effect of an appearance on traditional media. And why not, to satisfy your curiosity also in real time. Knowing the real-time data instead of the 2 or 3 regular hours can give us a good margin for maneuver to change the settings of any campaign or to modify the landing page of an announcement so that we can further increase the conversion our visits. In short, if you have not already done so, this is a good reason to go and the new version of google Analytics and adapt to the new way to display data from our website. On February 17 begins a new edition of Specialization Course in Digital Marketing for SMEs offered by the Chamber of Commerce Sabadell. This course is the equivalent of a university graduate and is taught in person every Friday morning, February to June, at the headquarters of the camera in Sabadell (which has parking in the same building). As its name suggests, the course aims to get attendees to become specialists in Digital Marketing, so throughout their sessions will be discussed in depth topics such as SEO, SEM, the Social Media Marketing, Advertising network, online public relations press and blogs, all conversion techniques contacts and visits clients and web analytics. Digital Marketing Course for Pymes. If you want to attend the presentation, you can come to the House on January 12 and you can listen to the conference "10 mistakes companies to raise their communication on the Internet"And presentation of the course. This event is free, but seating is limited, so if you wish to attend, contact the Chamber as soon as possible. The next 11 and May 31 I am pleased to teach two classes in Olot WordPress: a first session and a second basic WordPress, WordPress Advanced. Organized by the Higher Education Foundation of Olot. How it works hosting service. How a database is created. How does an FTP program and how you can use to upload files to our hosting. How it works at a basic level (publication and page entries). How can I change the language. How you can customize its appearance for longer looks like a blog and become a corporate website. No technical knowledge for installing WordPress are needed, how little there is to know is what I explain in class. How to Improve SEO for WordPress appear in the top positions on search engines. How to embed videos and other content in WordPress. What are the best plugins to enhance your WordPress. With these plugins we can: create a good contact form, get a multilanguage site, include the "likes" of Facebook and the "Twit this" Twitter, connect with our WordPress Twitter, etc. How the payment templates work and how we can change the design of the same. How the e-commerce plugin for WordPress that we posed to sell books, tickets, etc. How to create a good who we are. How to create a good where we are. How to create product listings. Aiming the web client and not product. If you want to attend the course (one day or two days), please contact Marta Figueras of Higher Education Foundation of Olot (972262128) http://fes.olot.cat. 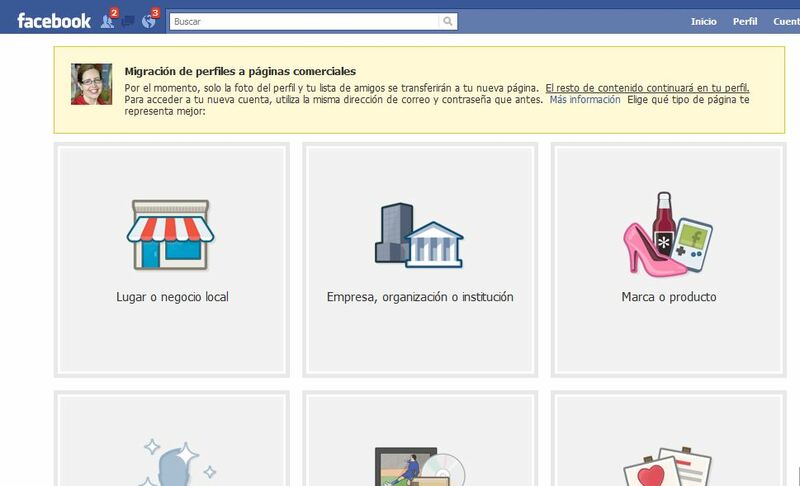 For a couple of weeks ago Facebook is facilitating the work of all those companies that have finally decided to spend their profiles pages. For it has created a new feature that allows conversion in a minimum of time. From a page you can write on the wall of anyone. Pages have an unlimited number of fans (which does not happen with the profiles, which are limited to 5,000 friends). Pages allow the inclusion of HTML code that makes them more attractive and more features. Facebook editorial standards indicate that businesses and other entities should not use pages and profiles. So the reasons are many. The problem until recently, was that you could only migrate a profile person to a company page by hand. With this new tool, Facebook facilitates the transfer of part of the profile information to a new page, but not all. Migra profile pictures and migrates all friends (this was the heaviest). But does not migrate the complementary content. What it does provide is information to download content and then re-upload it on the page.